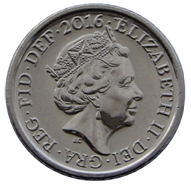 For the pre-decimal British one penny coin, see Penny (British pre-decimal coin). For silver pennies produced after 1820, see Maundy money. The correct plural form for multiple 1p coins is pennies (e.g. fifty pennies). The correct term for monetary amounts of pennies greater than 1p is pence (e.g. one pound and twenty pence). One penny and two pence coins are legal tender only up to the sum of 20p; this means that it is permissible to refuse payment of sums greater than this amount in 1p and 2p coins in order to settle a debt. However, since the strict and archaic legal definitions of terms like "legal tender" and "debt" do not apply to most everyday transactions (such as paying for goods in shops) these rules are seldom, if ever, strictly upheld. The penny was originally minted from bronze, but since 1992 it has been minted in copper-plated steel due to the increasing price of metal. Soaring copper prices in the mid-2000s caused the value of the copper in the pre-1992 coins (which are 97% copper) to exceed the coins' face value. For example, in May 2006, the intrinsic metal value of a pre-1992 1p coin was about 1.5 pence. During 2008, the value of copper fell dramatically from these peaks. 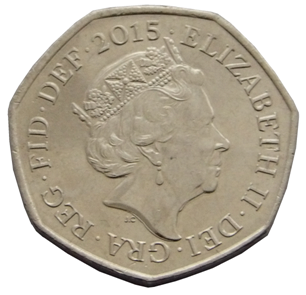 As of 31 March 2016 there were an estimated 11,430 million 1p coins in circulation, with an estimated total face value of £114.299 million. The original reverse of the coin, designed by Christopher Ironside, and used from 1971 to 2008, is a crowned portcullis with chains (an adaptation of the Badge of Henry VII which is now the Badge of the Palace of Westminster), with the numeral "1" written below the portcullis, and either NEW PENNY (1971–1981) or ONE PENNY (1982–2008) above the portcullis. To date, four different obverses have been used. In all cases, the inscription is ELIZABETH II D.G.REG.F.D. 2013, where 2013 is replaced by the year of minting. In the original design both sides of the coin are encircled by dots, a common feature on coins, known as beading. As with all new decimal currency, until 1984 the portrait of Queen Elizabeth II by Arnold Machin appeared on the obverse, in which the Queen wears the 'Girls of Great Britain and Ireland' Tiara. The words NEW PENNY were inscribed above the portcullis up until 1981. From 1982 the inscription changed to ONE PENNY. Between 1998 and 2015 the portrait by Ian Rank-Broadley has been used, again featuring the tiara, with a signature-mark IRB below the portrait. In August 2005 the Royal Mint launched a competition to find new reverse designs for all circulating coins apart from the £2 coin. The winner, announced in April 2008, was Matthew Dent, whose designs were gradually introduced into circulating British coinage from mid-2008. 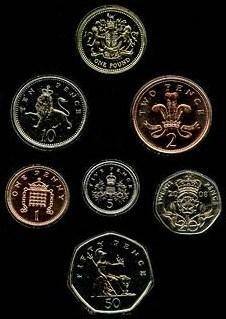 The designs for the 1p, 2p, 5p, 10p, 20p and 50p coins depict sections of the Royal Shield that form the whole shield when placed together. The entire shield is featured on the £1 coin. 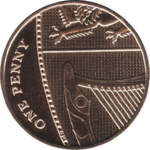 The 1p coin depicts the left section between the first and third quarter of the shield, representing England and Northern Ireland. The coin's obverse remains largely unchanged, but the beading (the ring of dots around the coin's circumference), which no longer features on the coin's reverse, has also been removed from the obverse. ^ "Royal Mint Frequently Asked Questions". Archived from the original on 2014-03-10. ^ a b c d e f "1p Coin". British Royal Mint. Archived from the original on 2006-04-27. Retrieved 2006-05-23.